This is the fourth post on the 150 Slater development, and the last in the Down, Down, Down series (the name needs to be retired). On the lot where 150 Slater is being built were a number of buildings, all now demolished. In the first Down, Down, Down post, I detailed (among other demolitions) the building at the corner of Slater and O'Connor, which housed the Café Deluxe and O'Connor Smoke Shop. "The Premier Apartments were built in 1938 for David Epstein, a developer specalizing in apartment buildings. His most notable project is to be found at Bank and Central Park. Architect W.E. Noffke introduced the Spanish Colonial Revival style to Ottawa in the years prior to WWI. Twenty-five years later he was still employing some vestiges of it at the Premier-using a fringe of red clay roof tiles over the third floor balconies, twisted wrought-iron railings, and glazed terra cotta panels flanking the storefonts." In Down, Down, Down Update 2, I detailed the other two buildings fronting on O'Connor, and I also posted a couple of photos of the former Laurier Computer building. This last is the focus of today's post, and it perhaps has the richest history. So what were those doing on a computer store? Well it wasn't a computer store for its entire life. For a long time, it was actually an indoor sports facility, called the Rideau Winter Club. A building this small? No! In the '60s(?) it was chopped down to one storey and pretty shallow off Laurier. As you can see, the Rideau Winter Club had a much taller and longer profile, and you can even make out in the eMap aerial shot the outline of the foundation still going all the way back to the lotline. The roofline of the shortened Laurier Computer building is evident from the height of the graffiti, but less obvious is the shadow from the Rideau Winter Club's former roofline, about 2.5 storeys above the top of the graffiti. They chopped off all but the first storey, and shortened the depth from the streetfront considerably. The above cans are so old, they didn't have pull tabs; you had to open it with a can opener (the kind that creates a triangular opening). Laurier Computer has relocated next door (how convenient!). I'd like to thank Martin Yshikawa at Laurier Computer (Laurier.com) for the photos of the Laurier Computer building and inlay detail. I'm eager to see the excavation of the basement. What other treasures are to be found underneath? Awesome photos of the inlays of the curling and badminton equipment. 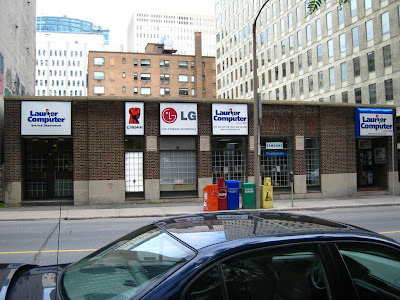 I never noticed those, and I must have been to Laurier Computers a dozen times. Note: when the rest of the site was excavated, the old cooling pipes for the curling rink were found just under the surface.